Until now I have only posted examples of close and physically connected objects that display greatly discordant redshifts. But I thought it appropriate that my tenth post be of a single newly discovered object whose redshift puts it in great discord with currently accepted astrophysics and even the Big Bang Theory. The science journal Nature recently reported that late last year a group of astronomers discovered what they claim to be is the most distant quasar known in the Universe so far. The quasar, designated ULAS J1120+0641, has a redshift of 7.085 z which reportedly places it at a distance of 12.9 billion light years away! 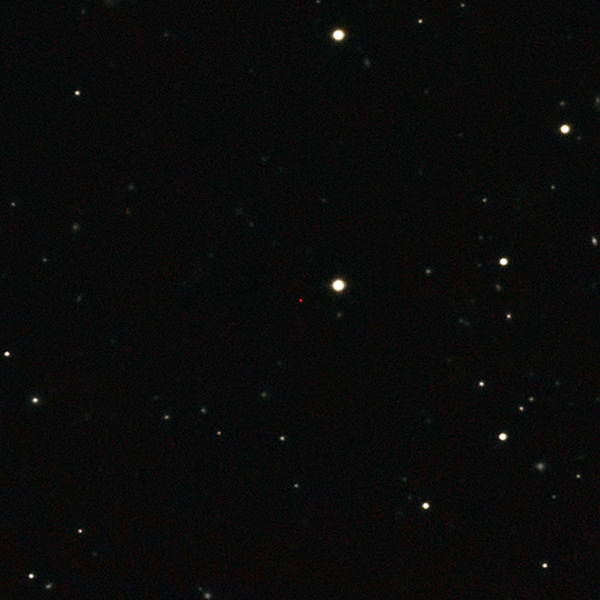 The redshift of ULAS J1120+0641 was measured with the FOcal Reducer and low dispersion Spectrograph (FORS2) on the Very Large Telescope (VLT) of the European Southern Observatory (ESO) and the Gemini Multi-Object Spectrograph (GMOS) and Gemini Near-Infrared Spectrograph (GNIRS). That its redshift could be measured at all is something of a minor miracle considering the supposed distance of the quasar. If an object really is located almost 13 billion light years away it would have to be exceptionally bright for enough of its light to reach us to allow for the analysis of its spectrum. Apparently the team of astronomers thought the same thing because they reported that the brightness of the object is 63 trillion times that of our sun! That is so bright that if this object were located at the distance of Alpha Centauri (4.37 ly) it would still appear over 800 times brighter than our sun! This is an absolutely incredible amount of light when you consider Alpha Centauri is located over 276,000 times further away from us than our sun. What could possibly generate the energy required to power such an unimaginably bright object? The answer, according to the scientists, is a supermassive black hole with a mass equal to 2 billion of our suns. If volume were equal to mass that many suns would take up every cubic inch of our solar system from the center to out beyond the orbit of Jupiter! Of course any object that massive and emitting that much light must also project a tremendous radiation field. In this case the astronomy team predicts an ionized near zone radius of 6.2 million light years. That is almost two and a half times the distance between the Milky Way and Andromeda galaxies! All of these truly astronomical numbers are dazzling in their scope and imagination. They describe a quasar whose very existence really is almost beyond the scope of our physics and the comprehension of our minds. But they also describe an object that cannot exist according to the currently accepted version of the Big Bang Theory. According to the accepted interpretation of the redshift of ULAS J1120+0641 this quasar existed just 770 million years after the Big Bang. 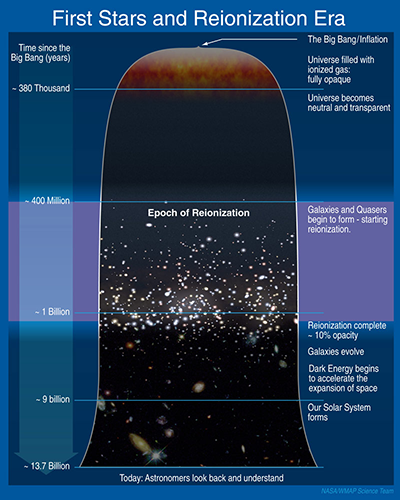 This is during a period called the Epoch of Reionization which supposedly occurred between 150 million and one billion years after the Big Bang. It is theorized that early in this period the first stars and quasars were formed. These were followed by the formation of galaxies starting approximately 500 million years after the Big Bang. However, 770 million years is not enough time for the formation of a supermassive black hole with a mass of 2 billion suns according to the Eddington Limit. An enormously powerful quasar may make for intriguing headlines, but there are no accepted physics that can account for the existence of such an object. The astronomy team and the scientific community in general were quite surprised at these results and continue to struggle for an answer that will explain the formation of an object, over 12 million times brighter than a Type Ia supernova, so early in the formation of the universe. The first thing that scientists should do is step back and question the wisdom of unblinkingly accepting redshifts as measurements of distance and cosmic expansion. It is this blind acceptance that has forced them to resort to creating such exotic objects as ULAS J1120+0641 in order to try to continue to make sense of the Big Bang Theory. But instead they will probably just do something like change the Eddington Limit, just as they have changed the Hubble Constant over the years to suit their needs. Eventually though objects will be found with redshifts so high that scientists will no longer be able to explain away their non-cosmological origins. One way or the other they are going to have to change the way they view the universe. In the meantime I will continue to post the latest discoveries, and discordancies, and continue to welcome and encourage your input…as always.